Rumor has it that one of my co-workers has a birthday coming up this week but rather than bake him a cake, I know for a fact that Frank's partial to apple pie and I've been told I bake a pretty decent one. 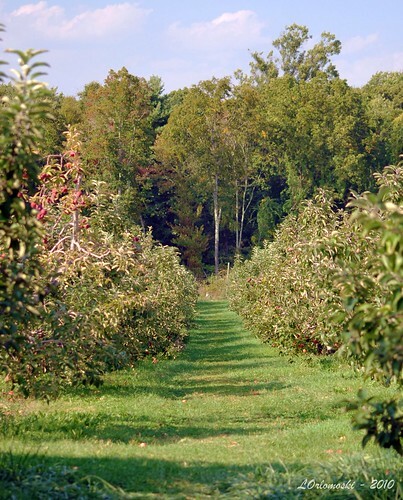 With that being the case, I decided after work on Saturday that a trip to the apple orchard was in order as you can't bake an apple pie without apples! I called up our family friend Amy and asked if she'd like to take a drive over with Jamie and I as I know that Amy like to take pictures almost as much as I do and it seemed like a good photo op. In spite of aching ankles, Amy was up for it so we made the short drive over to Gales Ferry. 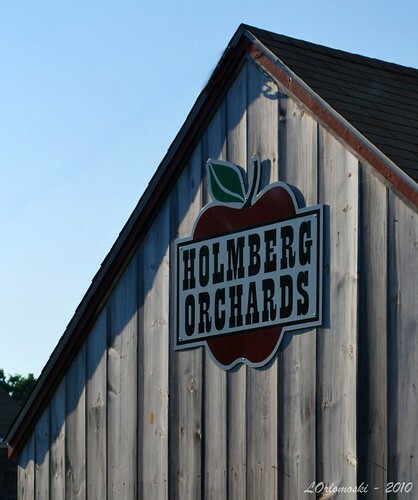 Holmberg Orchards is a family-run enterprise that is currently in its fourth generation. 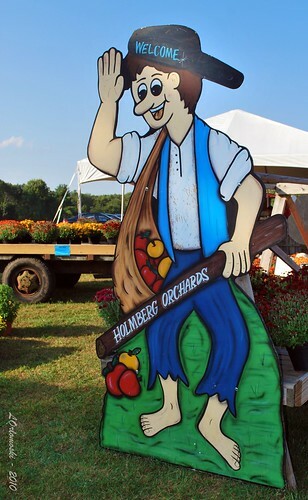 The property was originally purchased by the Holmberg family in 1896 by Adolph and Hulda who grew and sold what were reputed to be some of the finest vegetables in Southeastern Connecticut. 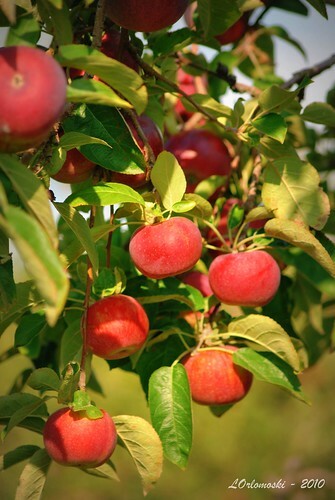 In 1931 the farm was bought by sons Harold and Henry who began planting peach, apple, and pear trees in 1935. 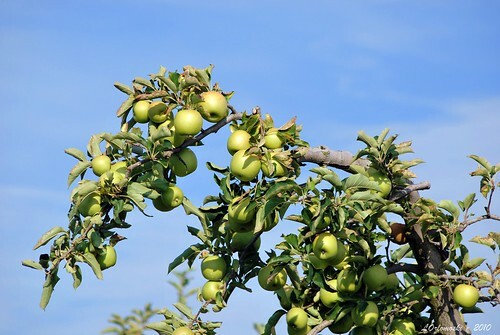 Today the commitment to grow "the finest fruit for the finest customers" is carried out by Harold's son Richard and his wife, Diane, along with two of their children. 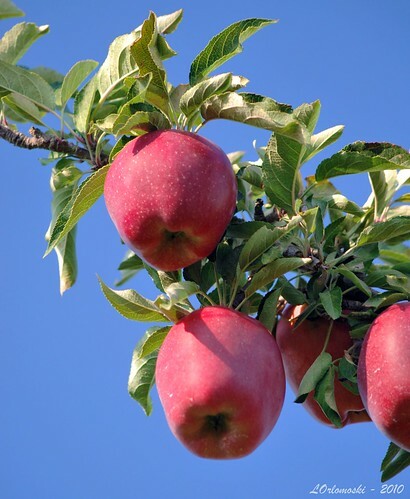 Though the orchard offers six different varieties of apples, my favorite has always been a nice Cortland and Holmberg had them in abundance just begging to be plucked off of their branches. Jamie said that she thought this one was sporting a wig it had some many leaves attached! 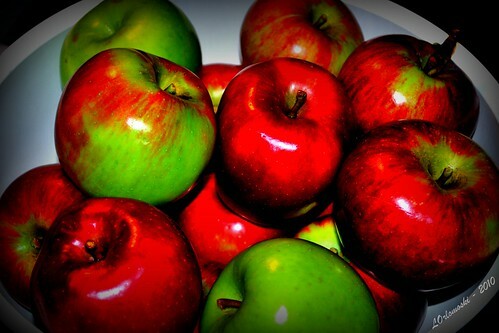 Of course, I'm not the only one eating these apples so we had to get some of Jamie's all-time favorite - Red Delicious! 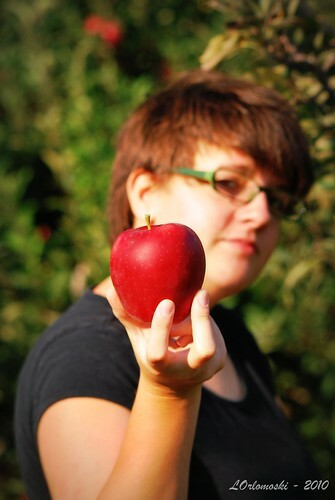 That's an apple fit for Snow White right there! 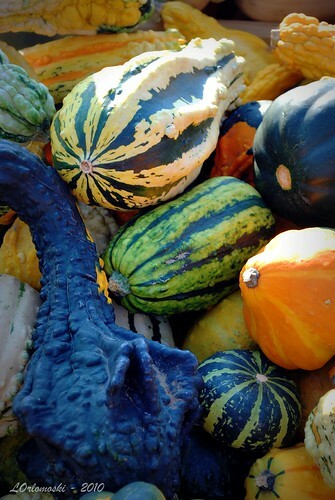 These are Mutsu which Jamie told me are very good so we picked a few of those to go into the bag, too. 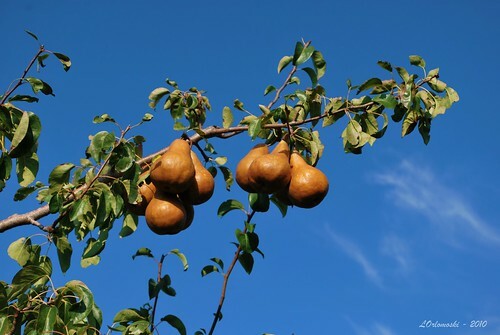 Holmberg also had quite a crop of Bosch Pears but we didn't get any as Jamie said she only likes the green pears. Picky! Picky! 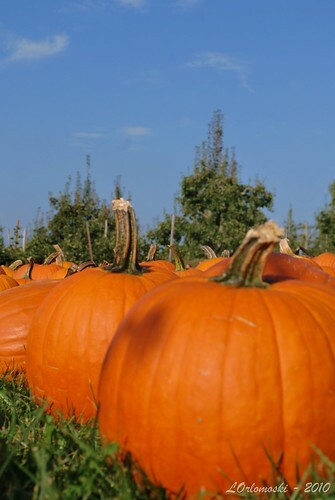 What's an orchard without pumpkins? 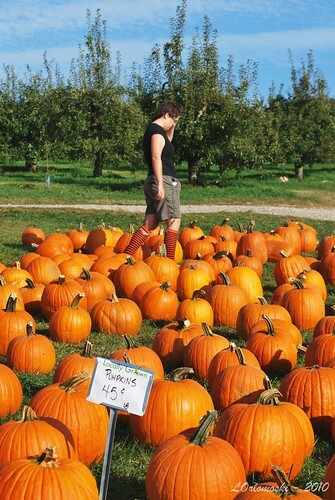 So many pumpkins that a girl just can't decide! We ended up not getting a pumpkin just yet as Jamie said she wanted to wait until closer to Halloween. I'm pretty sure there will be one or two left when she does decide she wants one and we go back again! 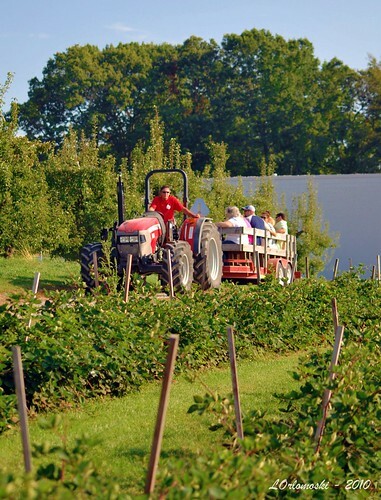 There were plenty of people, young and old alike, taking tractor rides around the orchards but we opted not to on this trip though it did look like fun. 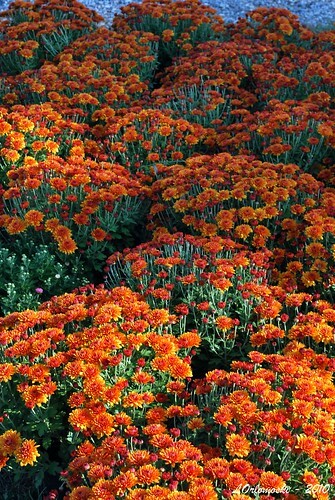 ... and the beautiful fall mums, too! There were jugs and jugs of fresh apple cider - another of Jamie's favorites. By the way, Jamie, just how tall are you this fall? We ended up with a nice assortment of apples that shined up real pretty once I got them home and rinsed them off. I think there's enough there to bake a nice birthday pie for Frank as well as have one or two to eat but if we run out, Holmberg Orchards is just a short drive down the road and maybe next time the weather might be more fall-like rather than the 85 degrees with humidity that it was on Saturday. Ugh! You're killing me! 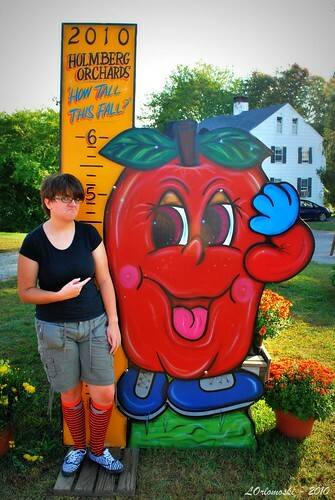 I've not been apple-picking in decades! In fact, the last time was with Mr. X! 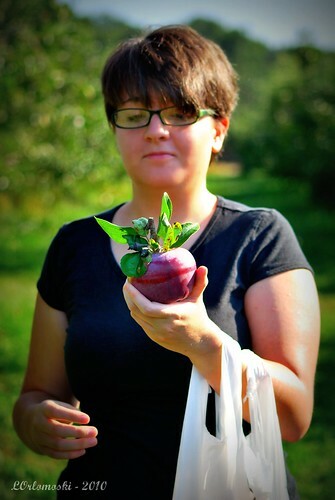 Next weekend my sisterdear Lynda and her family are taking Aria out on her 2nd apple-picking day! I can't wait for the photos! 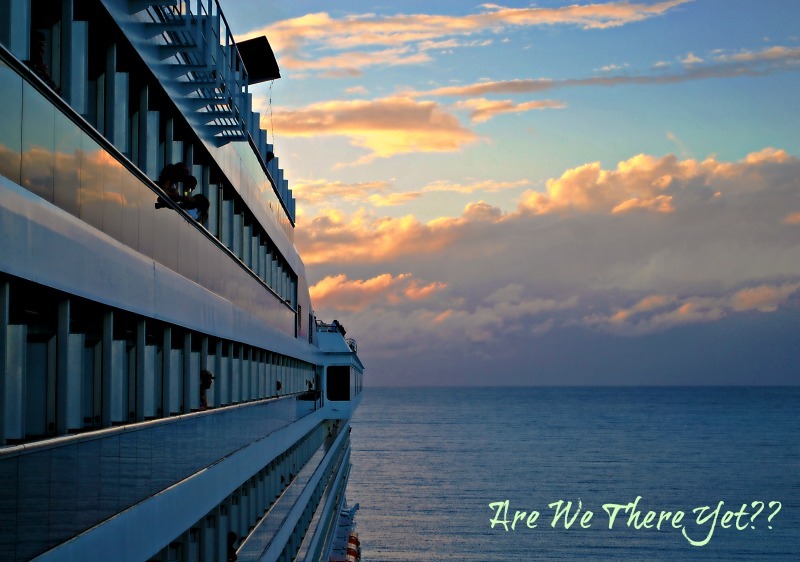 Your photos are glorious, as always! And I'm betting your friend Frank is going to love his pie! Wish I could have a slice myself! beautiful shots! I especially love the ones with Jaime and the apple. Reminds me of Eve! MMMM, apple cider! Like your new template picture. Good pictures, as usual. Lucky friend Frank! Those photos are awesome. 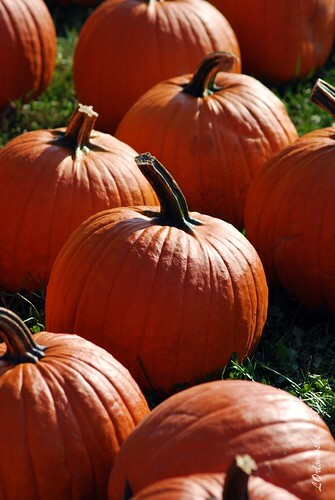 I can almost smell those great lookin' apples. So Frank is the only one that gets apple pie? Not fair. The shots are great and what a great time. Wish I could have come along. I would have enjoyed this trip very much. Granny Smith's are my favorites. I like the tart sweetness. "By the rude bridge that arched the flood ... "